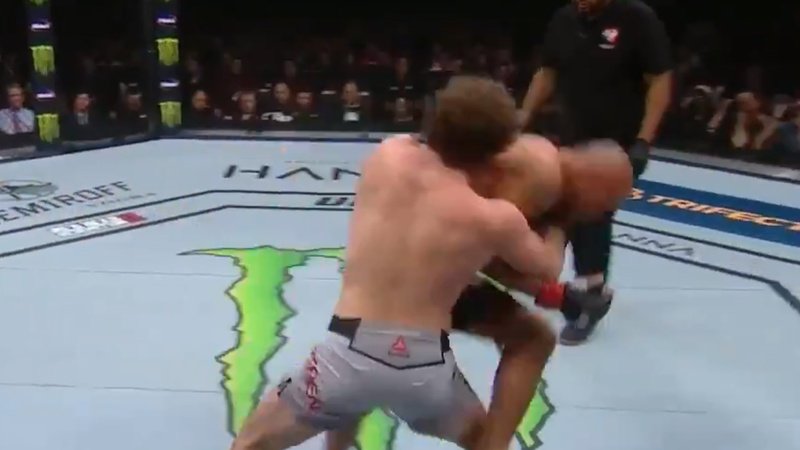 Bulldog Choke Victory For Ben Askren Over Robbie Lawler, What A Mistake By Herb Dean! UFC 235 PPV (pay-per-view) event is set to go down tonight (Saturday, March 2, 2019) from inside T-Mobile Arena in Las Vegas, Nevada. Welcome to the Welterweight fight between the former Bellator and ONE champion Ben Askren and the former UFC 170-pound title holder Robbie Lawler. Askren tries to take Lawler down, Lawler defends. Wow, Lawler slammed Askren, is the referee going to stop this? Herb Dean is insane, but Askren survives this brutal slam!!! Robbie Lawler continues raining punches, but Askren stands up. Wow, Lawler delivers a big knee! Again brutal uppercut, Askren is bleeding heavily. Askren goes into the clinch again, he tries to go for the under hook. Lawler lands knees to the mid-section. Now Askren tries to deliver a knee from the clinch, but he only holds the rival against the cage. Again a good knee by Lawler. This leech Askren is so damn annoying, goes for a low single leg, and now his hands are up, but Lawler sprawls, Askren didn’t make to complete double leg takedown. Askren takes his back, both fighters on the ground. It looks like a bulldog choke! Wait, what is happening here? Was the fight even finished? I think this was a mistake by Herb Dean! Robbie’s finger was up, he was showing he can continue!!! Herb Dean stops the fight, it is done, victory for Askren. Ben Askren improves the score to 19-0, 1 NC MMA, 1-0 UFC, Robbie Lawler drops to 28-13, 1 NC MMA, 13-7 UFC.